They’re known as “indie rejects”. They also starred in the 2003 movie “Riding in Vans with Boys” and were the cause of the cameras being there, filmed on the Pop Disaster Tour as opening acts for Green Day, Blink-182, and Jimmy Eat World. The boys of Kut U Up are: Brandon Parkhurst - guitar and vocals, Micah Mattson - guitar and vocals, Brendan Raasch - drums and vocals and Chris Cote - Bass Guitar and vocals. 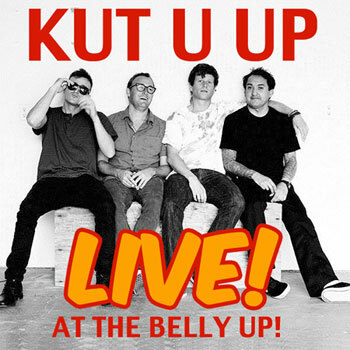 On July 31, 2008 Kut U Up played their first show in nearly 5 years, stating at the time that it was strictly one-off. However, the band reformed in early 2011 and are starting to record a follow up to their 2003 release “Pulled Over.” A free downloadable track is available on their website.